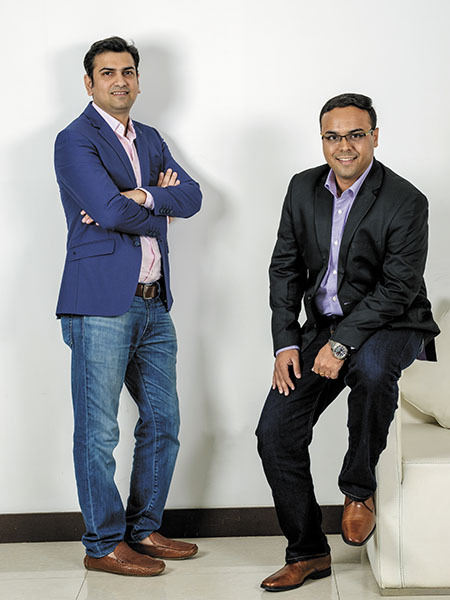 There are 52 million hours of phone calls recorded every day worldwide, by call centres and such like, say Umesh Sachdev and Ravi Saraogi, co-founders of Uniphore Software Systems. And, based on industry estimates, only 1 percent of that voice data ever gets analysed. However, companies such as Uniphore are changing that skew by bringing machine learning and automation to analyses, and providing large businesses—from insurance companies to airlines—with useful, and often, real-time information. A classic example of their work would be a voice-engine based automated response system to quickly switch a call to a human agent, when it “senses” a caller’s distress or note of urgency, Sachdev says. Today, such things are possible, and are being tried out at large businesses, say Sachdev, 31, CEO, and Saraogi, 32, president for Asia Pacific. Voice-based biometrics too is no longer in the realm of science fiction. Sooner, rather than later, millions of people in India’s small towns, and even villages, can expect to speak into their smartphones to buy things online, transfer money, and so on. And Uniphore, which will turn 10 next year, is well-placed to tap that massive opportunity. This potential was validated in December 2017 by a significant infusion of money from John Chambers, chairman of Cisco Systems, in his personal capacity, in Uniphore’s series B funding. IDG Ventures, an existing investor, and IIFL also invested in this round. 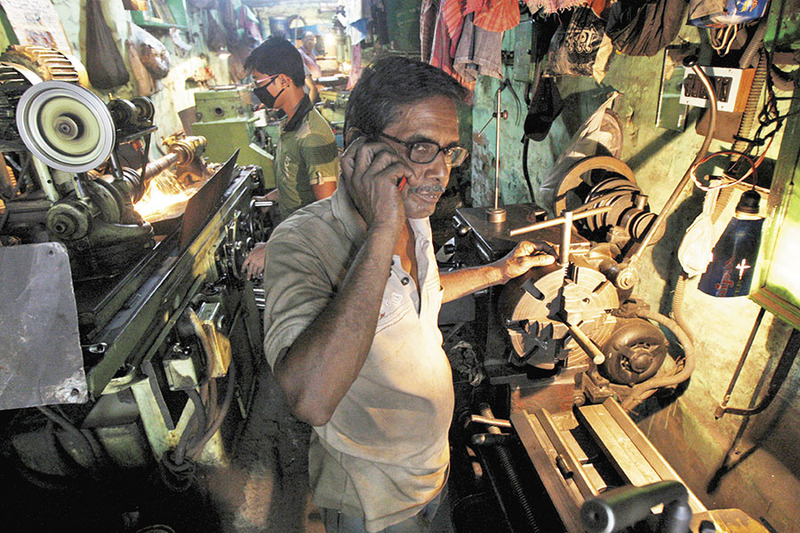 Uniphore has more than 70 large-business customers—including State Bank of India, ITC Ltd, and Tata group—touching 2 lakh hours of voice data every day, and 40 lakh end-consumers in total. It also claims to have accumulated six patents for its technologies. While the bottom-of-the-pyramid opportunity in India is believed to be huge in the longer run, for now, the path is more conventional, meaning customers are the corporate kind, willing to pay for high-end analytics of voice data. With voice recognition emerging as a large opportunity, Uniphore isn’t alone in this field. Competitors include CallMiner in Massachusetts, which provides cloud-based analytics of call-centre voice data, and California’s VoiceVault, building voice biometrics. And Hexolabs Interactive Technologies, also in Chennai, offers voice-based products that businesses can use to engage consumers in their own languages. Uniphore has three products: In speech analytics, a voice assistant, and in voice-based biometrics. Speech analytics is by far the biggest revenue earner because large businesses have accumulated terabytes of data, and continue to add more every day. “Uniphore is clearly a story of a hi-tech product being developed out of India to solve some of India’s biggest problems,” says Sachdev. He and Saraogi hope that eventually their work will have “global relevance”, as the company scales up. Chambers expects Uniphore to double its sales each year, for the next few years at least. The telecom veteran has even taken on a formal role at the startup, as Chief Guru, reflecting the idea that he will be a very hands-on mentor. This is already having an impact on how Uniphore conducts itself. For instance, for every new position to be filled, the HR manager is mandated to interview at least two women applicants. “We are currently at about 32 percent in terms of women employees, and we would like to at least push that to 50 percent, if not higher,” Saraogi said. 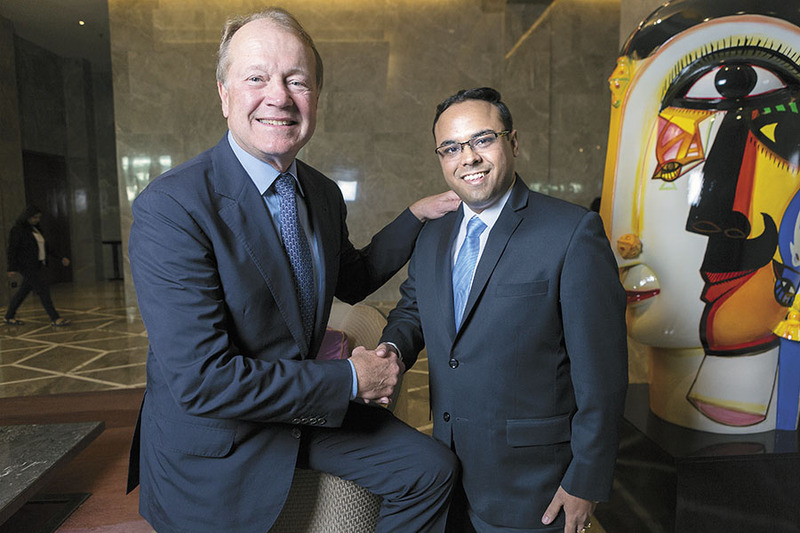 Sachdev and Saraogi also expect staff strength to increase from about a 100 now to a few thousand over the next two or three years. The company is headquartered in Chennai, and has offices in Singapore and Bengaluru. Sachdev and Saraogi were almost compulsive entrepreneurs, all the way back to college. They met as students at Jaypee Institute of Information Technology in New Delhi, and, in their second year, submitted a location-based mobile theft detection prototype in a competition run by Gemalto, the world’s largest SIM card maker. Their prototype earned them a spot among the top three entrants, and a visit to Paris, and “the SIM card company offered to work with us to commercialise it”, says Sachdev. By their final year—they graduated in 2007—a business plan competition sponsored by Intel helped them decide between building further on their project or pursuing higher studies. They proposed a business plan around their earlier prototype, and won the top spot among entrants from India, which placed them among the top three teams at University of California, Berkeley, where Intel brought in international teams. This success pushed them to try and build Singularis, their first startup, launched during their final year at college. The combination of a tech before its time, and rookie entrepreneurs who didn’t understand the importance of marketing and sales, meant that the venture didn’t do well commercially, they say. The experience, however, proved handy when they set up Uniphore, which they incubated at Indian Institute of Technology (IIT) Madras, starting 2008. “We didn’t start with a tech idea, but a large-scale problem that we wanted to solve,” says Sachdev. A $100,000 grant from the National Research Development Council, in 2008, helped get things off the ground, according to a profile of the company on the tech and entrepreneurship website Inc42. Sachdev and Saraogi realised that in India alone at that time, 70 percent of the population was disconnected from the so-called digital revolution. And not just for lack of connectivity, but because everything on the internet was in English, and people did not know how to use it. Sachdev adds that although the country may have crossed the 400-million milestone, by number of people with access to the internet, only one in four of those is probably an active user. This they saw for themselves, when they spent several weeks in the villages of Tamil Nadu, where even SMSes were received more than sent, with voice calls and missed calls—when someone would call them back—being the norm. Sachdev and Saraogi wanted to enable every Indian, who wanted to use their own language, to access banking, health care or education over their mobile phones. For this, they needed to develop speech-recognition technology, machine learning and Artificial Intelligence (AI). At that time, much of the work in speech recognition-related technology had been done for the English language, and in advanced economies. No one had worked with Indian languages at scale, that too under Indian conditions of ambient noise. A lot of their research and development was initially done at IIT Madras, and it was only when the company grew that they built its own labs in Chennai. They soon realised that the tech they were building had a lot of applications in the corporate world, and an important customer was Thomson Reuters, Sachdev says, which used Uniphore’s voice assistance technology on its Market Lite (earlier called Market Light) service that sent useful information to farmers. Market Lite was SMS-based and later used a mobile app. Uniphore’s voice tech enhanced the service, he says. Analysing human verbal communication requires an analysis of not just the words, but also of emotions, intonations, pauses, and emphasis. The technology to analyse these nuances is becoming increasingly sophisticated, thanks to the work done by companies such as Microsoft, Google and Amazon, as well as Uniphore. “Now you don’t need a human being to listen to the 1 percent of calls; you can automate this, with a computer listening to 100 percent of the calls,” says Sachdev. The technology also helps figure out, “Is someone likely to switch to a competitor? Is there a demand for a product that a business doesn’t have yet, and so on… this is powerful.” For instance, Uniphore’s voice-assistance solution can understand 80 global languages, including 17 Indian ones. Based on this, the company has made an application for a leading insurance company in India to advise end-users retirement planning. “Consumers can be doing this in Hindi or Telugu or another Indian language,” says Sachdev. The company expects the technology to integrate with applications in health care, for instance, via wearable devices, or home entertainment and connected cars. Uniphore’s third product, based on biometrics, provides a critical element needed for processing transactions—authentication. The human voice, which is unique for every person, can be used for authentication purposes. Uniphore’s technology will enable Indians to speak in their own languages and dialects as part of this authentication process. After five years of selling their software as a bespoke solution, Uniphore switched gears to become a software-as-a-service business, following a series A round of funding in 2013, led by investor Naga Prakasam via the Indian Angel Network. In late 2013, a chance meeting with a senior executive at a large credit card company gave Sachdev and Saraogi the opportunity to try out their algorithms, ironically, in English. The success of their software opened the doors to the opportunities of analysing voice data. Today, their analytics product leads the venture’s revenues. In 2015, IDG Ventures and Infosys co-founder Senapathy Gopalakrishnan, who is on the board of the IITs research park, invested in Uniphore. Chambers is said to have invested as much $4 million for the 10 percent stake he picked up in the venture, according to a person with knowledge of the deal. They money will come in handy, as there is potential for R&D beyond “our lifetime”, the entrepreneurs say, as they expect thousands of applications, especially of enterprise products. A near-term goal also is to enter the US market and get a sizeable share in the next 12 to 15 months. Uniphore has also started an R&D unit in Redmond, Seattle, this year and plans to expand it, while adding at least two more offices in America.